Owls are raptors, birds of prey. They provide sustenance and defend themselves with strong, sharp breaks and talons. The owl's ability to avoid detection is perhaps the most important weapon in his defensive arsenal, since it allows him to avoid confrontation in the first place. Like other birds in the raptor group, owls of all species use their beaks and talons to defend themselves. An owl's feet are equipped with particularly long, sharp and curved claws, which he can dig into an adversary and use like hooks to tear and rip at flesh. While not all owls' beaks are as prominently large and hooked as those of other birds in the raptor group, they are still sharp and strong, Along with the talons they aid the owl in literally tearing apart both predator and prey. Because an owl's biggest self-defense and attack asset is his curved, pointed talons, he attacks feet-first. He swoops in with his feet first, leading with the razor-sharp claws so he can latch onto his foe. 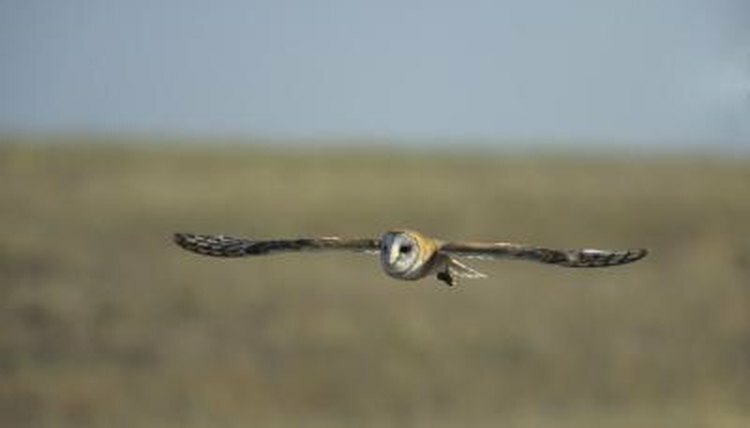 When targeting prey, an owl can usually kill his target quickly, if not immediately, because he swoops in with his talons in attack position. When his prey or another territorial bird fights him, his talons are his primary weapon. Even with their strong beaks and sharp claws, owls don't have a terribly easy life. Around half of all owls die within a year of leaving the nest, with starvation being just one notable cause. Owls can't always successfully defend themselves from other animals, particularly their prey. Great horned owls, for example, are often found either dead or injured as a result of would-be prey like skunks and porcupines fighting back. Perhaps an owl's best method of self-defense is to avoid predation altogether -- these birds are notably stealthy animals. Owls' serrated feathers allow them to fly practically silently. Most owls are nocturnal; their large eyes give them a sense of sight better at night than many other animals. These physical characteristics allow them to hunt with the element of surprise, seizing prey before it can react. The Raptor Trust: What's a Raptor?